Voice-over artists are just that – Artists. Much more than a pleasant voice is needed to sound good on a recording; in fact, there’s an entire field of study devoted strictly to vocalisation. A foreign-speaking person who isn’t trained in the art of voice-over could do harm to your language translation or voice-performance project. You need someone who’s trained and dynamic – a true asset to your product. 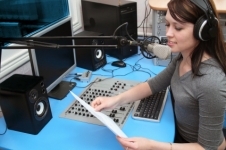 Recording studio confidence: If your ‘voice’ has never been in a recording studio, he or she might freeze in front of the microphone, leaving your commercial or other audio in the cold. Breath control and support: Voices that aren’t properly supported by the diaphragm and anticipatory breath control will fall off or sound shallow and weak. Clear speech: If your contractor isn’t trained in proper enunciation, words can be muffled. Extra mouth sounds can intrude, making your message less-than-clear. Regional accents: A voice-over actor who knows how to speak in the correct dialect and accent, convincingly, is imperative. Timing: Professional voice-over performers know how to fit your message into the allotted timeframe. Emotion: Actors who specialise in voice-over use emphasis and tone to convey the emotions of your choosing. Stamina: When reading from long scripts, trained voice-over artists can maintain consistent pace, tone, and voice strength. Network Languages will acquire your script, gather specific requirements, find a voice-over artist perfect for your job, schedule a recording time that works well for all parties, and deliver the final recording in the format of your choice.